Free for Life - Never pay your cable or satellite fee for television again! 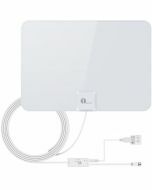 The 1byone antenna can pull in all of your local news, sitcoms, kids and sports programs. Detachable Amplifier - Enables you with the opportunity to watch no signal lose, stronger signal and high clarity HDTV shows. 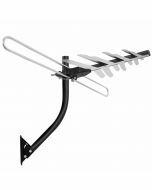 Receive Free Local HDTV, VHF and UHF Signals - The 1byone antenna allows you to pick up free local VHF and UHF high-definition and standard definition signals. Maximal Range: 80 Miles. All Mounting Accessories Included - Included mounting pole allows you to easily place the antenna for best reception. Easy Installation - Unwrap, Plug in, and Scan channels. 3. Comes with mounting pole for best pole placement. With a range of up to 80 miles yet only taking up 1 meter of space, the 1byone Antenna is ideal for solving challenging outdoor antenna placement requirements.